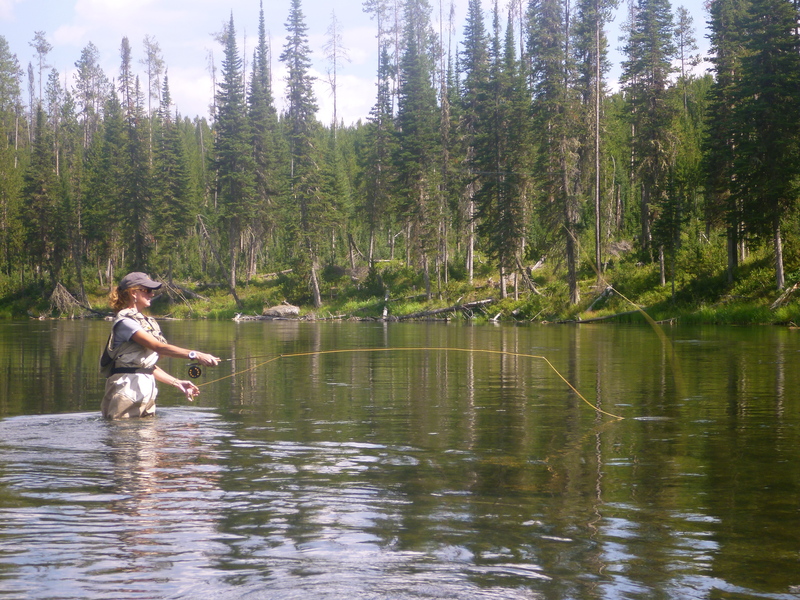 For starters, let me just say “Taisie learns to Fly-Fish” is an overstatement. 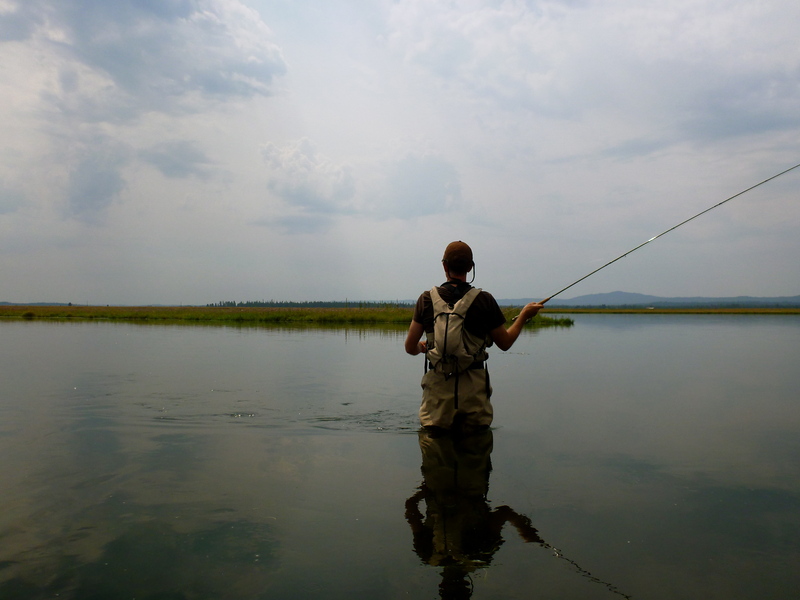 “I’m learning to fly-fish” would be a more appropriate title for this blog. 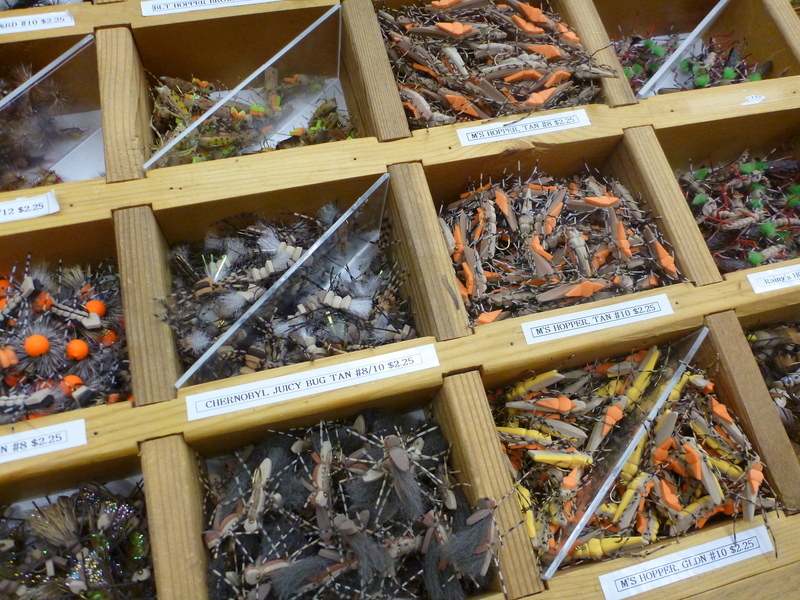 It only took a decade of being a fishing widow for the fly-fishing bug to finally bite me. In the past, I had no desire to fish since this self-proclaimed borderline adrenaline junkie thought that standing in one place fishing and doing an activity that didn’t get your heart rate over 150 would be just too boring. It was on one of those perfect autumn days last year in Eastern Idaho that I waited in the truck with our dog on a highway pullout near Harriman State Park (dogs not allowed) for what seemed like hours. 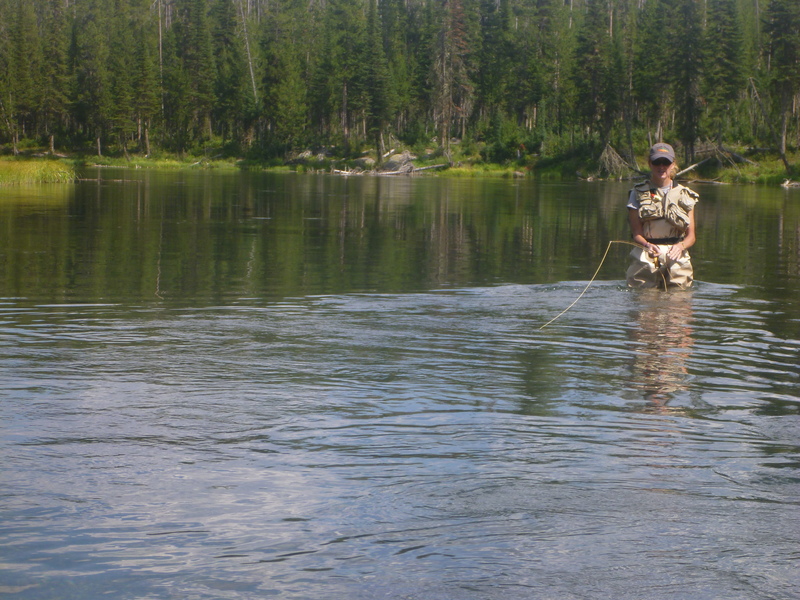 My husband Bob, unfazed by time, happily fished on the beautiful Henry’s Fork without a care in the world. Not being bothered about waiting before, for some reason at this particular moment my patience wore off. I decided that I’d had just about enough and now I wanted to go out there and see what all the fuss was about. 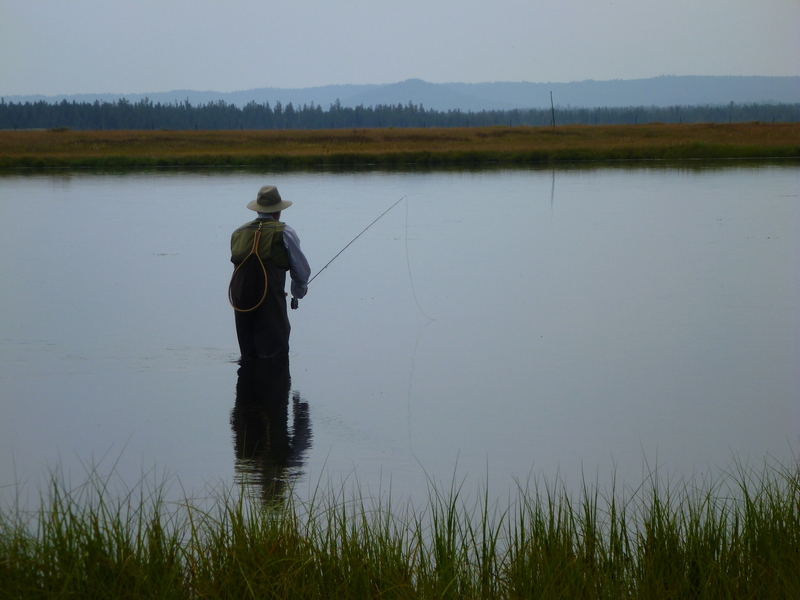 Luckily, my husband had plenty of old fly-fishing equipment to loan me so coming up with the money for a new fly rod wasn’t the issue; my problem was that Bob told me under no circumstances he’d teach me. He told me that there are certain things you don’t try to teach your spouse and one of those things is fly-fishing. 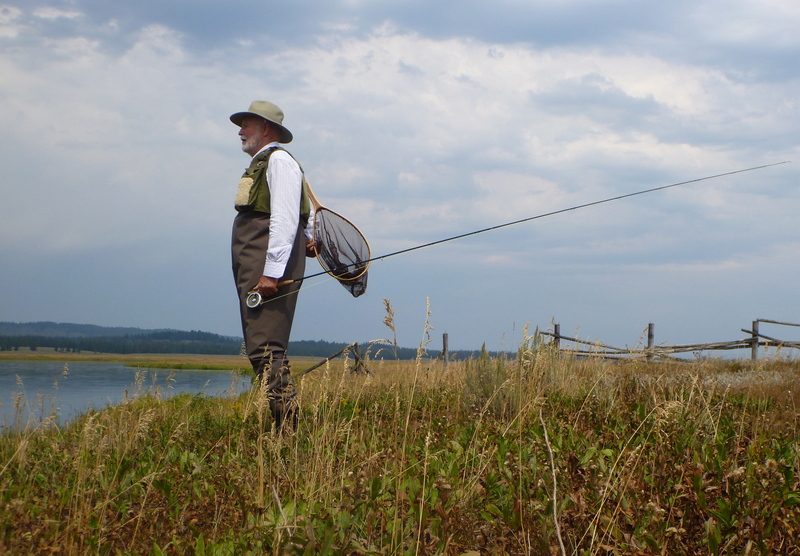 Still not totally committed to the idea of learning to fly-fish, while shopping at a local discount outdoor store a pair of women’s Patagonia fly-fishing wader’s just my size were so ridiculously marked down that they made up my mind. 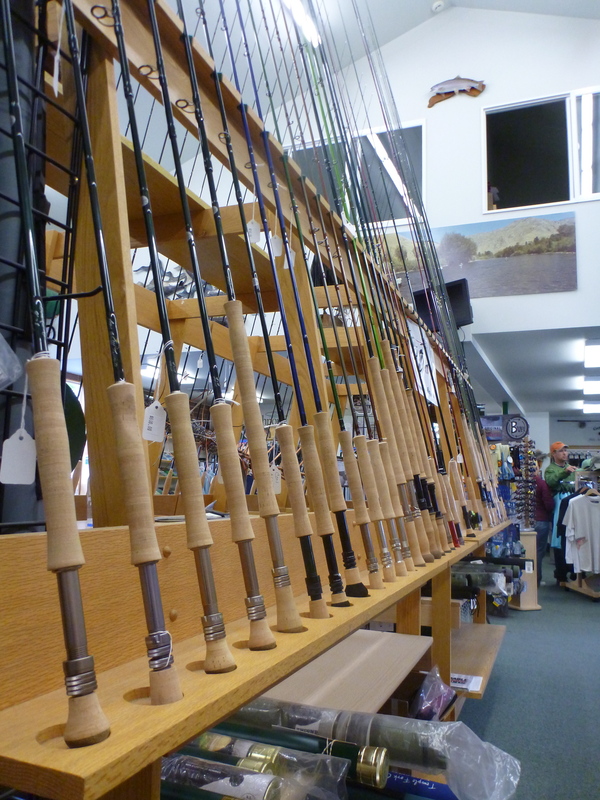 I couldn’t pass up such a great deal, and for Christmas the next month Bob gave me a pair of wading boots and a gift certificate for group beginner fly-fishing lessons at Idaho Angler in Boise. 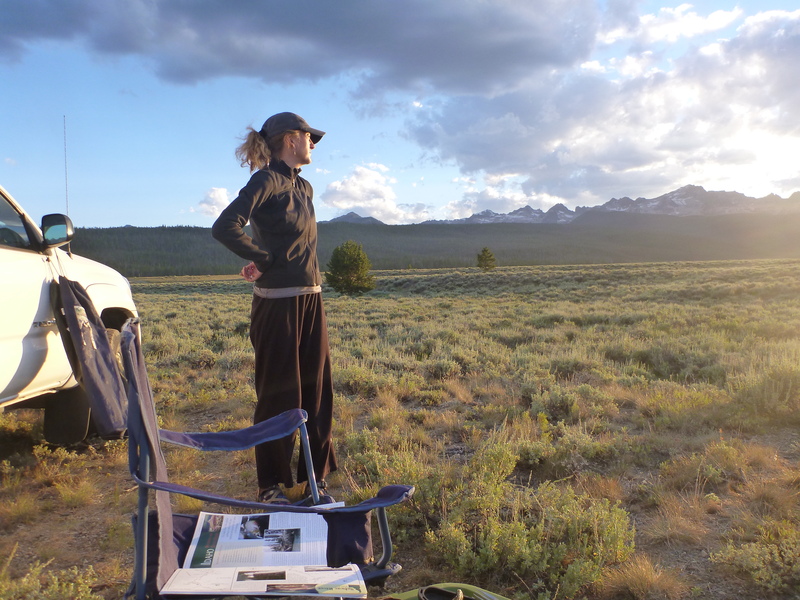 Last spring, I signed up for the lessons along with my friend Jeri, another fly-fishing widow. Jeri and I arrived at Idaho Angler for our class and met up with the two other people in the class. Everyone had some fishing experience in the past except me. I prayed that I wasn’t getting way in over my head since I’d never actually held a fly rod in my hand before. 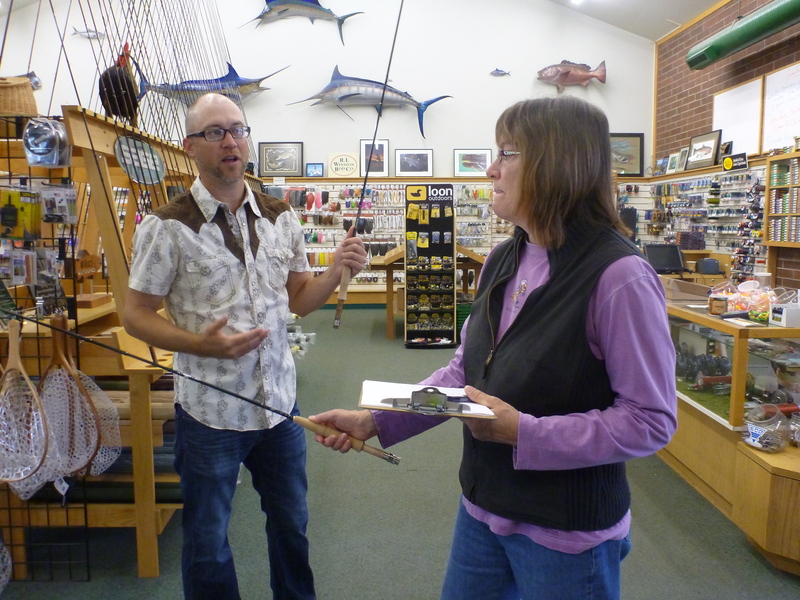 Our super nice instructor Chris, went over the basic fly-fishing equipment like fly rods (not a pole, as Bob has corrected me several times), reels, fly-line, tippet, and the different types of flies. 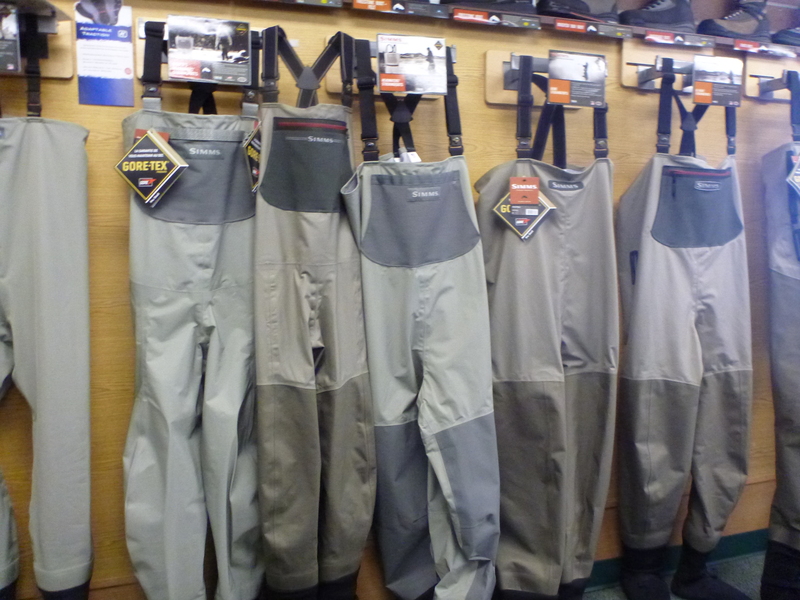 As we looked at the very expensive waders hanging on the wall, I patted myself on the back for purchasing them already in the off-season and knowing they were at home just waiting for their maiden voyage. 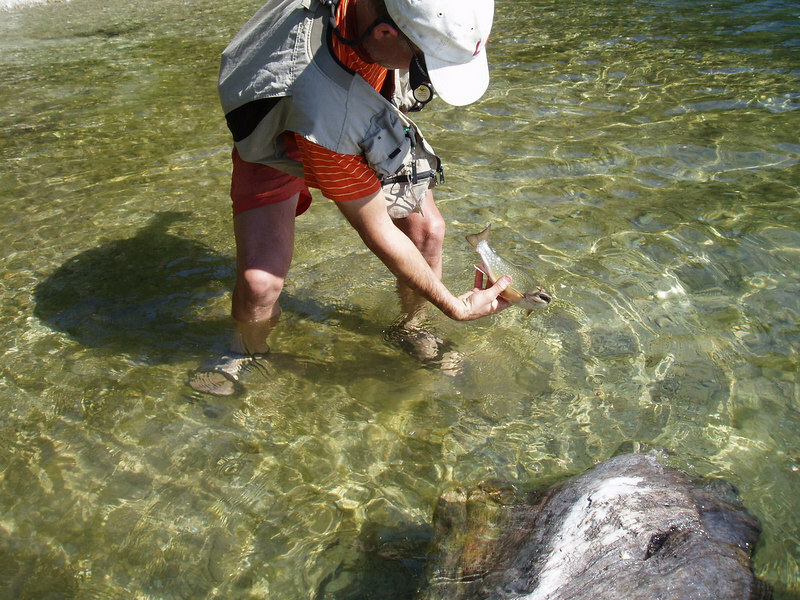 Dry flies float on the surface of the water. I learned that the bright florescent colors are for us to see, not for the fish! After going over the rest of the apparel we headed upstairs to learn how to tie flies onto the tippet and tippet onto a fly line. I thought I’d have an advantage on my fellow classmates since I’m used to working with my fingers making jewelry but I was just as fumble-fingered as the rest. 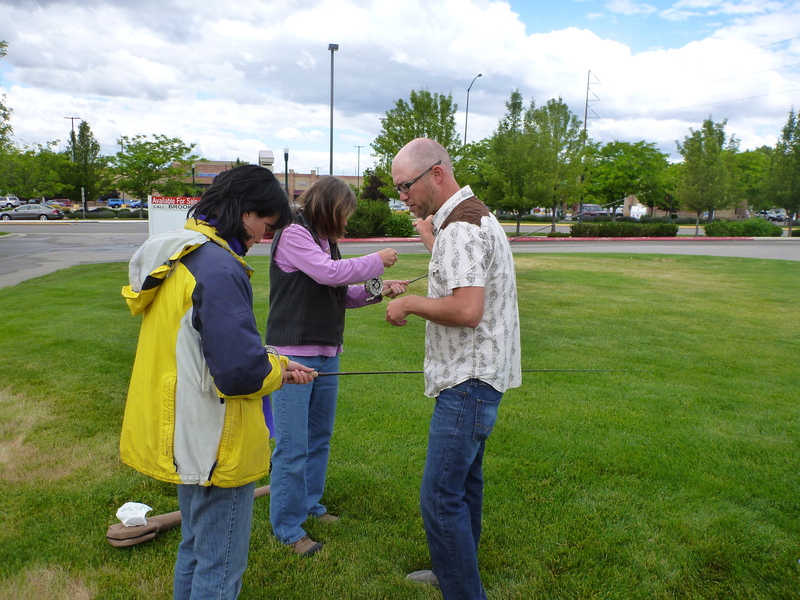 We didn’t spend a lot of time on the different types of knots so we’d have more time to practice casting outside on the lawn. Casting was the part I was most nervous about doing since in the past I’ve seen my husband make it look easy with his effortless casts. Well, as I suspected, it wasn’t easy and wasn’t pretty. After about an hour of casting and working on arm and wrist positions and untangling my lines and feeling like I was developing carpal tunnel, the class was over. For the next month, I practiced casting in the back yard and worked on perfecting my improved clinch knot until finally I was felt that I ready for some real fishing. 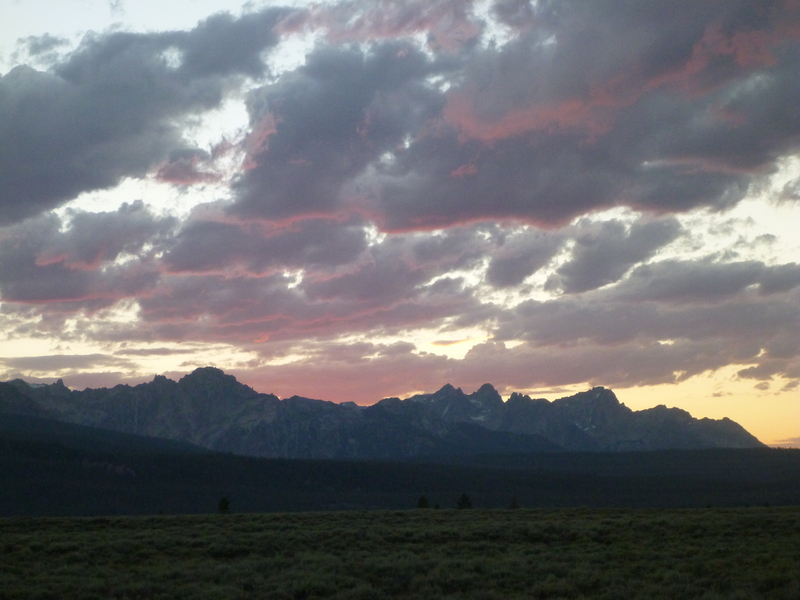 The Salmon River near our favorite camping spot in the Idaho Sawtooth mountains would be my first taste. I didn’t want anyone to be watching my first time and about freaked when we pulled up to the spot where we planned to fish. A half dozen spinning reel fishermen and their wives sitting on lawn chairs lined the bank. I wanted to back out of fishing that day but Bob said we’d head downstream way far away from them. Even though Bob said he’d never teach me, he graciously gave me tips and helped me along. I didn’t catch any fish on the Salmon River but still enjoyed every minute of it and wasn’t bored at all! I was immediately hooked and couldn’t wait for more. The next day, we fished near the inlet of Pettit Lake. Bob caught a few little brook trout but I only managed to catch the hook on myself a few times. 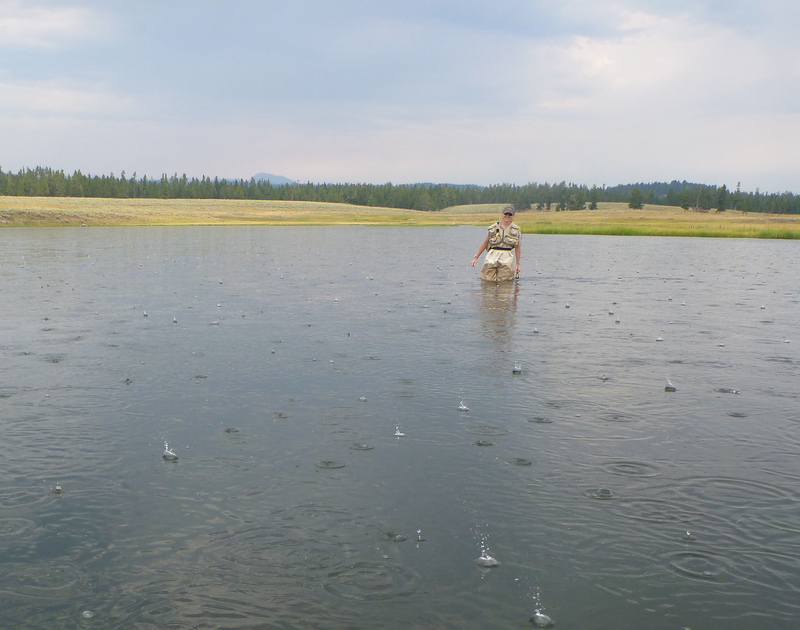 Fly-fishing on a lake was so different and harder than the day before. I much preferred the experience of carefully and slowly walking downstream and watching the current carry your fly. 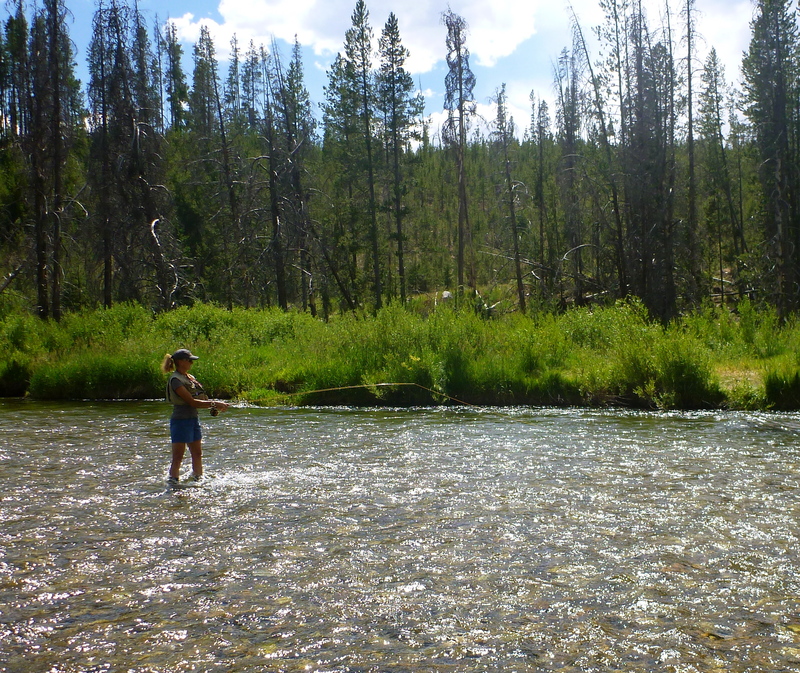 Excited to try fly-fishing in the river again, my next experience was on the Railroad Ranch on the Henry’s Fork where the previous year I’d waited for hours in the truck. The Henry’s Fork is special to Bob. It’s where he learned to fly-fish from his dad when he was a young boy. This part of the river is for serious fishermen and the fish there spook easy and are hard to catch. I didn’t have any expectations to catch anything but merely to tag along with Bob and my father-in-law Jim to watch and learn. An unexpected afternoon thunderstorm brought some rain and lightening just as we got to the river’s edge but the storm quickly passed. What a beautiful river. I enjoyed just standing in the slow moving river watching weeds and moss float by in the calm, crystal clear water. 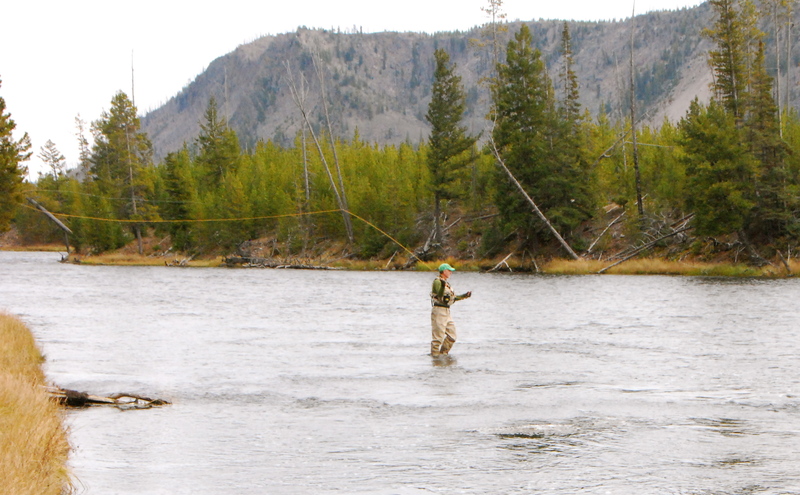 My father-in-law Jim fishing the slow moving Henry’s Fork, in his fifth decade of catching and releasing trout here. 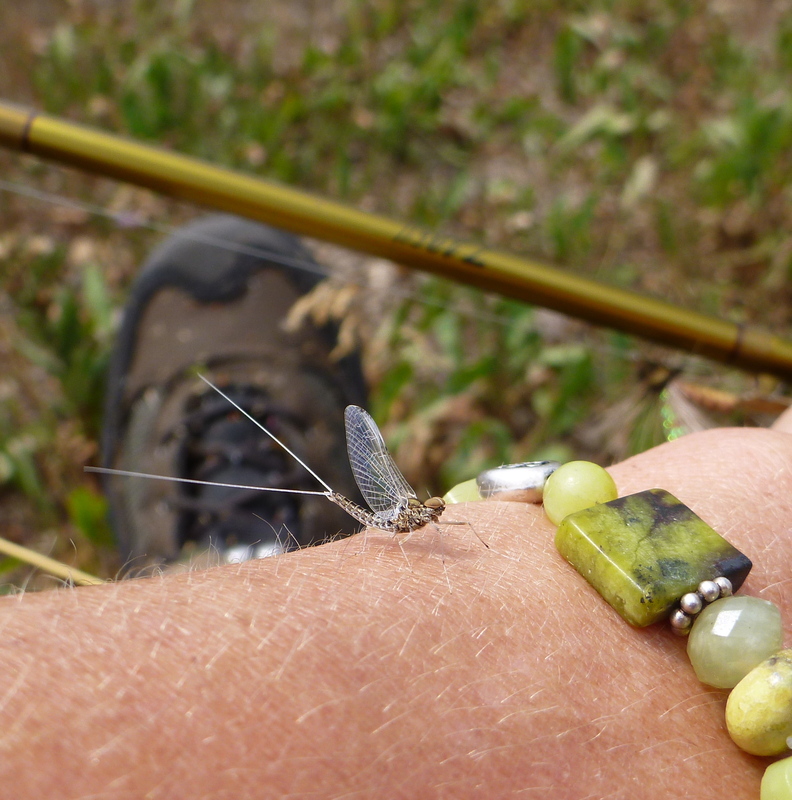 A tiny Mayfly landed on my wrist. Maybe curious about my bracelet? 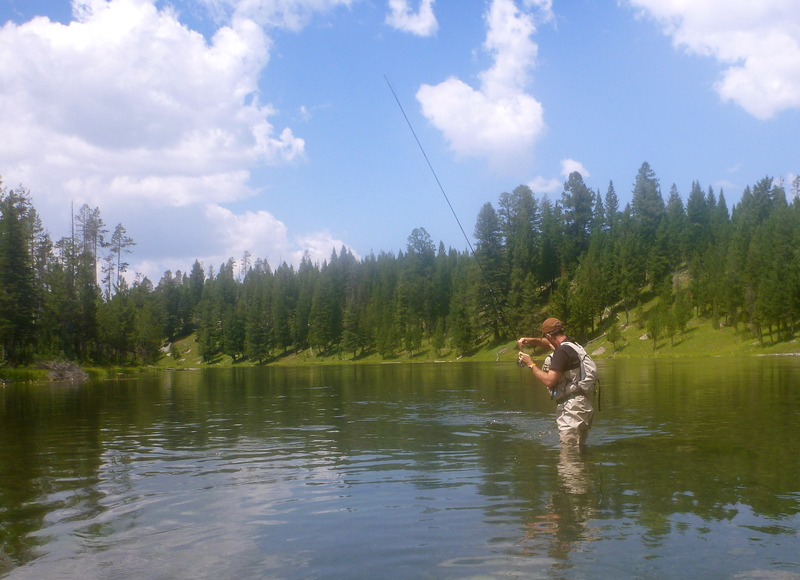 The next day, we fished another beautiful stretch of the Henry’s Fork near Coffee Pot campground in Island Park. It’s amazing standing in the middle of a river seeing the forest from a different perspective. I saw golden eagles, heron, ducks, and kingfishers flying over my head. I found myself watching the birds more than what my dry fly in the water was doing. At one point, I got a bite and caught my first fish. A small rainbow about 8 inches long. I nervously reeled it in and carefully pulled the hook from it’s mouth and released it back to the river. We stayed on Henry’s Fork about 5 hours and during those hours, I didn’t have a care in the world except living in the moment and couldn’t believe where the time went. Now, I understand. Well, Leslie–we get a fisherwoman and a thoughtful, eloquent writer at the same time. Write on, sister! The pictures make me want to join that revery. They are lovely and evocative, as are you.